I was first introduced to A Trip to the Moon in the 2011 film Hugo, which honestly isn’t that great and actually shouldn’t have taken the time to go on a mini-lecture about classic film-making. But it did, and I learned something, so I guess there’s that. 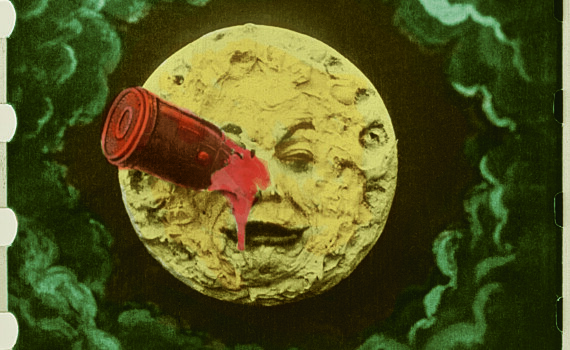 I learned about Georges Melies, a French filmmaker born in 1861 who pioneered many methods that would someday become standard in the industry; narrative stories, special effects, specific editing. He took the silent film and began to lead it in a more modernized direction, even as early as the first years of the 20th century. His contribution to cinema, specifically with this movie, is something that today’s filmmakers haven’t forgotten and hopefully never will. In this brief film, some cinematic methods that had never been seen before were first put to use. A Trip to the Moon lasts around 15 minutes, was black & white at first, but has since been colorized, and features no dialogue. This version has music underneath written by Air and has been produced to feel as modern as possible, but the original bones of the movie are still here for us to enjoy. Melies plays the main character, a professor with a wild idea; that men could launch themselves from a cannon all the way to the Moon. Some shout him down, others join the mad adventure, and so a group of men are on their way, shot out of a giant gun to a rock so very far away, not knowing what they might encounter. The story was inspired by Jules Verne & H.G. Wells, becoming perhaps the first sci-fi film ever created, complete with scientists, space travel, and aliens. It’s a short story, obviously, and so can be enjoyed quickly & easily. It’s not a plot that will impress, but than that’s not the point. This film is an icon for its use of theme and special effects, some of which had never been captured on film before. The way Melies used editing to create cuts in the action that looked real was ground-breaking and done only with set pieces and camera work. I can’t imagine any director today making such a bare bones project or working without computers and the newest equipment. And so A Trip to the Moon becomes a legend and a stepping stone, if not an exciting movie all on its own.